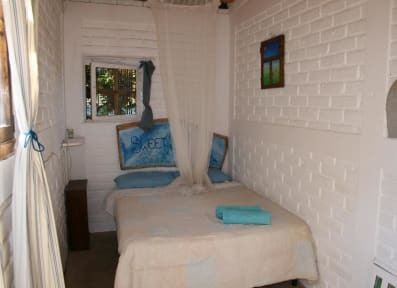 - Private room no.1, ´La Piña´ has a double bed and a large private patio consisting of open-air hot water shower and toilet, plus patio furniture and hammocks. - Private room no.2, the Garden Room, is tucked away in the corner of our tropical gardens for a little more seclusion. It has a double bed, hot water shower and toilet, and a small private patio. - Private room no.3 has a large queen size bed, built-in wardrobe, and also comes with a hot water shower and toilet. - Private room no.4 has 2 single beds, secure lockers, and is adjacent to a shared hot water shower and toilet. - The dorm room has 6 bunk beds, huge secure lockers, and is next to a shared hot water shower and toilet. Large communal areas, where you will also find plenty of information on touring the local area, either going solo or using local guides. Laying in hammocks amongst our tropical gardens is the perfect way to relax after your day´s exploration, hiking, or simply over-eating at the weekend food festivals. The gardens also feature a bbq pit and garden patio furniture. We offer weekly bbq and curry nights, whilst guests may also use our kitchen for their own home-cooking nights. The adjoining lounge area has a TV and large selection of DVD's, as well as board games and Salvadoran arts & crafts. 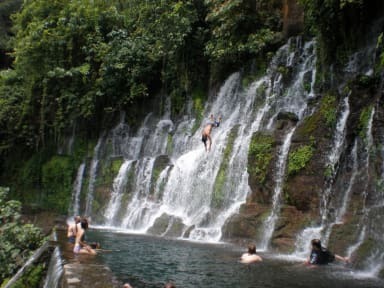 Juayua hosts its now famous Feria Gastronomica (food festival) every weekend throughout the entire year.